Before letting your kitten outside for the first time, he should be neutered, microchipped and should have completed his full course of vaccinations. Your garden will open up a whole new world to your kitten. It'll be rather overwhelming initially, so go out with him for short periods to start off with. Play with him and build his confidence, making sure he knows where the back door is so he can dash back if he wants to. 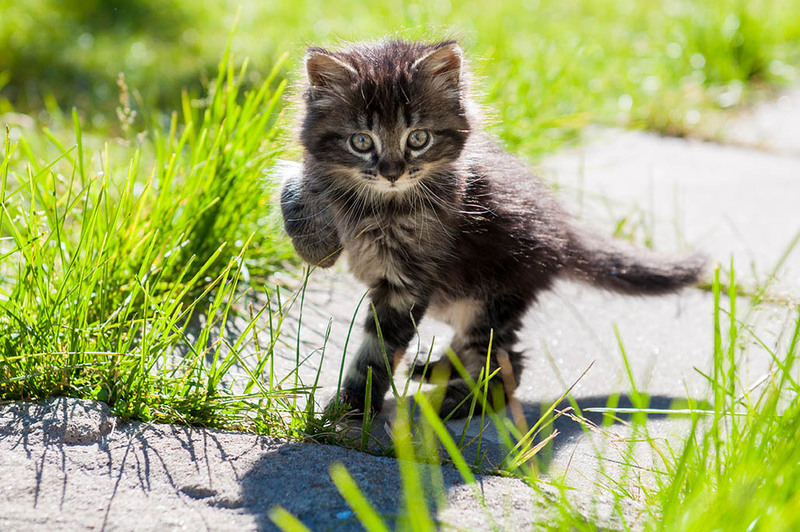 Make your outdoor space as safe as possible for your kitten's adventures before you take him out. Look for potential dangers - the places he could become trapped or items that could cause injury. Have a tidy up and remove any potential hazards. Before letting your kitten outside for the first time, he should be neutered, microchipped and should have completed his full course of vaccinations. He will also need time to settle at home and bond with his new family. During this time, you can practice a sound recall at feeding time so your kitten comes to you when he hears that sound. This will be particularly useful for when you want to call your kitten to come inside. Use a word like 'come' and reward your kitten with a treat (or his dinner) every time he responds to the call. You can start to slowly introduce your kitten to the outside once his recall is in place for short, supervised sessions, always keeping your kitten in sight. It's best to let him out just before mealtime so you can use your recall to call your kitten indoors and reward with tasty food or playtime. As the kitten grows older, the time outdoors can be increased until the kitten becomes independent and has learnt his recall down to a tee. It's important to remember that your kitten should have free access to his home at all times and should not be shut outside - consider installing a microchip cat flap so he can come and go as he pleases. Will my kitten roam far? For some, the drive to venture far doesn't last. Once boundaries are agreed with other neighbourhood felines, your kitten will settle with a modest territory with your garden at its centre. However, some are naturally dominant and will wander some distance from home, motivated by a need to hunt, to get attention, or to visit other cats' homes to eat. Cats are territory focused and will attempt to ward off feline intruders. Male or female, they see it as their business to protect their home. Fighting, however, is often the last resort. They will usually threaten by making lots of noise which can serve to frighten the intruder away. The latter will quietly back off, before turning tail and running. If you do decide to keep your kitten as an indoor-only cat, it is your responsibility to provide him with the entertainment and enrichment he needs in the home. Will my kitten become a hunter? 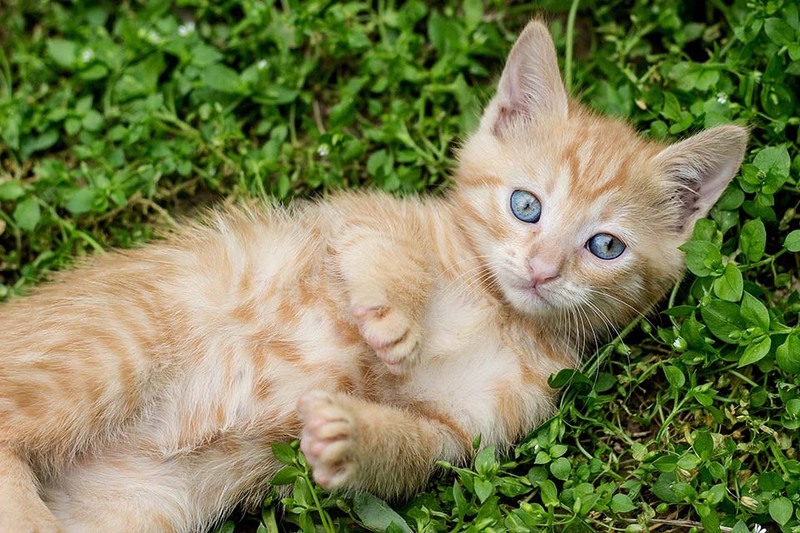 The average garden will be a natural playground, for a kitten; one that will excite his instincts to chase prey - and that could be flying insects like bees and butterflies, as well as birds. The thrill of the chase is irresistible, and the satisfaction in the successful catch can, for some, be addictive. Like all species of cat, the domestic cat is a carnivore and has inherited a drive to the hunt. They are 'designed' to be predators, and armed with good eyesight, teeth, claws, and turn of speed to ensure success. You only have to watch them in action with their toys to see that the moves are those of a natural hunter.